The study revealed that most pros worked in a number of genres. 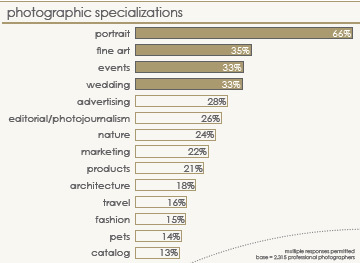 Most (66 percent) identified themselves as portrait photographers. Other genres included fine art (35 percent); events (33 percent); wedding (33 percent); advertising (28 percent); photojournalism (26 percent); nature (24 percent); marketing (22 percent); products (21 percent); architecture (18 percent); travel (16 percent); fashion (15 percent); pets (14 percent); and catalogs (13 percent). The survey showed that 97 percent of pros own DSLRs (up from 95 percent in 2011). 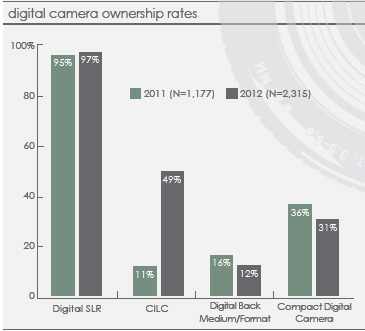 Twelve percent owned digital medium-format backs (down from 16 percent in 2011). Thirty-one percent owned digital compacts (down from 36 percent in 2011). Survey participants reported capturing 3,584 photos each month. Full-time pros reported capturing twice as many photos as part-timers. Advertising and wedding photographers reported taking the most photos, while fine art and nature photographers took the fewest. 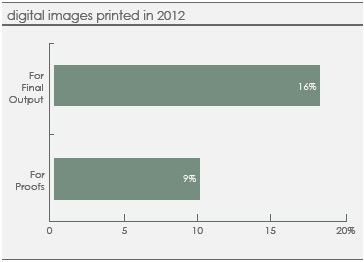 InfoTrends calculates that pro photographers produce about 320 proofs and 580 final prints each month. Only six percent of the pros surveyed said they don’t make prints. About one-quarter of the professional photographers in the study said they offered videography services to clients. Only 13 percent of wedding photographers offer video service. More than 44 percent of the survey respondents said they offer clients the opportunity to create photo merchandising using images they have taken—up from 39 percent in 2011. 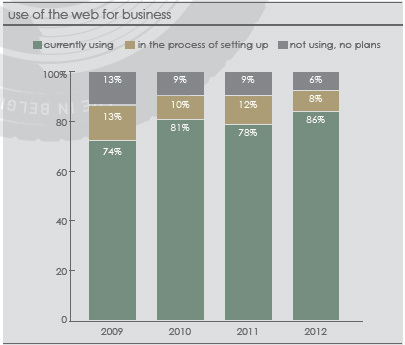 Only six percent said they did not use the Internet for business and had no plans to start, down from 13 percent in 2009. The share currently using the Internet for business increased to 86 percent from 74 percent in 2009. Lingering economic concerns are having an impact on professional photography, while competition in the market is growing and will likely accelerate. The good news is that consumers will have a need for professional photography services for important events and milestones regardless of the state of the economy. Modern DSLRs offer an increasing array of options for photographers. “Pro photographers can weather the economic storm by leveraging the Internet, merchandising, and video,” notes the survey.